Using Beneficial Insects on farms and in gardens is a great way to help control pest insects, such as aphids in lettuces, broccoli, cauliflower and other vegetables, because they hunt and eat the pest insects. When you get this normal in nature kind of control happening in your fields or in your gardens (large and small) there is rarely a need for the grower to resort to organic pesticides to manage the pest insect problems. 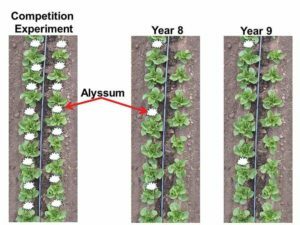 Here is a link to a great article about an organic farmer who grows romaine lettuce and inter-plants his fields with sweet alyssum as a way to attract beneficial insects into his lettuce crop. Yes, he is using this approach on a large scale, but even if you are a food gardener with a tiny vegetable plot, you can use the same approach. It will even work for container food gardeners. Below is a picture of his field plan on how after 9 years of using this method he now has found an ideal planting plan. There are other pictures in the article of the progression of years and how his planting plan has varied over the 9 years of successfully using this approach. Added bonus to this approach is you will get to enjoy the color, beauty and wonderful fragrance of the sweet alyssum! Wow, its February and I’m still not sure where January went. It seemed to fly by quickly enough, that is for sure! Before I get to far into this post, I want to let you know to explore the Open Farm Days and the Classes & Events pages of this blog. I’ve put up the dates and all the information for our annual Spring Open Farm Days. I’ve also updated all the classes and other events that are so far planned for 2019, including all the free workshops that will be part of our Open Farm Days on Saturdays and Sundays. We have so many new workshop topics planned, along with some of our regular favorite workshops. Have a look and see what you find of interest. There are also a lot of other events planned so far for this year and those are listed too. As more classes and events are planned, I will update that page, so check it often to see if there will be something happening you don’t want to miss. 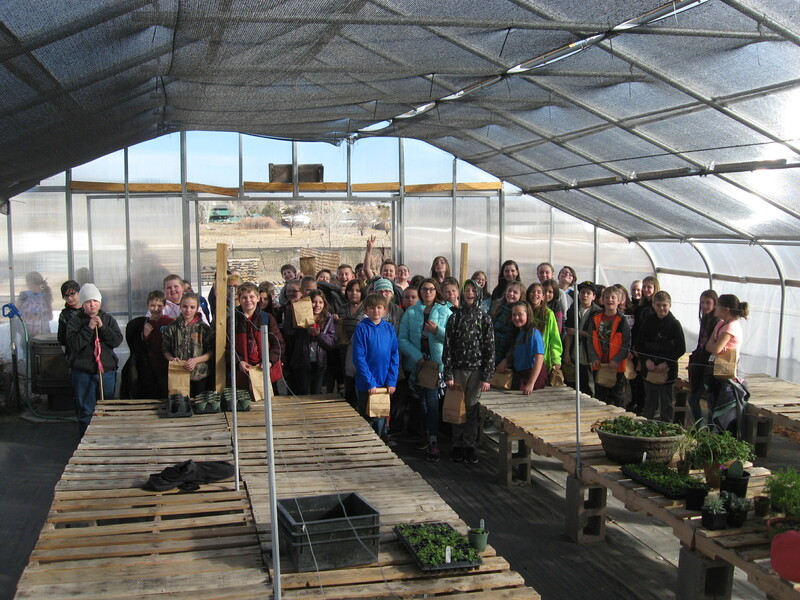 We had a wonderful day on Wednesday with the Harrison Fifth Grade classes visiting our farm. The kids showed up, all 62 of them, with their teachers in tow, and we all proceeded to explore the farm a bit. We had a plant hunt in the greenhouse for herbs that smell like pizza, chewing gum and a grandma’s perfume. Then we went to the Hygge Greenhouse and had a conversation about different kinds of plant roots. The kids all planted Violas, which are edible flowers, to take home with them. That’s what is in their paper sacks so that the plants wouldn’t get too cold on their walk back to school from the farm. It was a grand day and we enjoyed each and every one of these kids and their teachers!! A big giant thank you to Lizz too. This was a lot of kids in one giant group and I was sure glad to have Lizz’ helping hands. 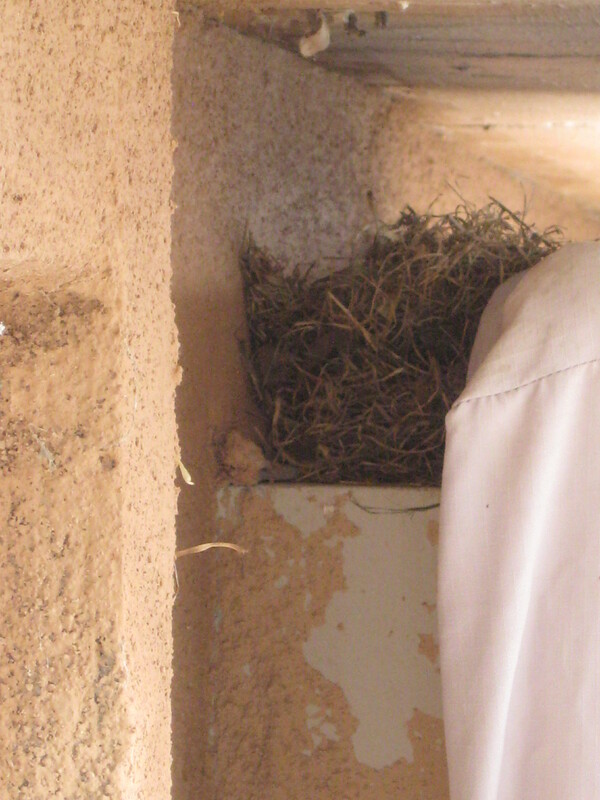 I noticed on Monday, as I was shoveling snow on the back sidewalks, that a squirrel was busy building a nest on the small ledge between the top of the swamp cooler and the house. Hmmm There will soon be baby squirrels scampering about. Figs, Glorious Figs!! The fig plants are growing really fast now. 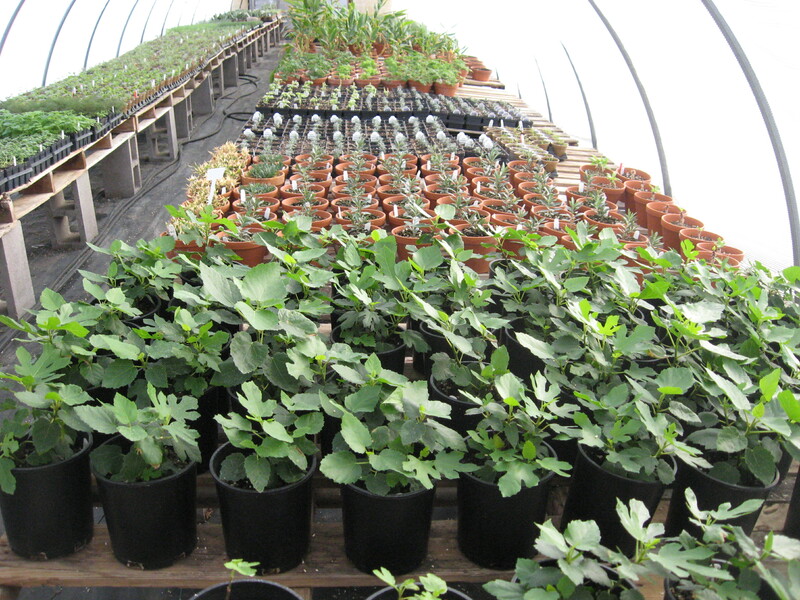 We started selling our extra fig pots to our wholesale customers this week, but most of these fig plants will be for retail sale in our Farm Stand store this spring during Open Farm Days. These figs are hardy to zone 5. I have one growing in my garden for the past 4 years. It thrives. I also have one growing in a large pot indoors so that I can eat fresh figs all winter too. Delicious! Have a look at this picture. I was feeding the duckel (is this even a real word?) of duck women their breakfast one day this week, and I looked up to see, not more than 30-40 feet away, some deer in the distance waiting to see if I would walk away from the ducks before they had finished up their breakfast. Sorry deer. I normally sit and visit with the ducks while they eat, so on that morning I definitely stuck around until the ducks finished up eating. No point in feeding the ducks and the deer! 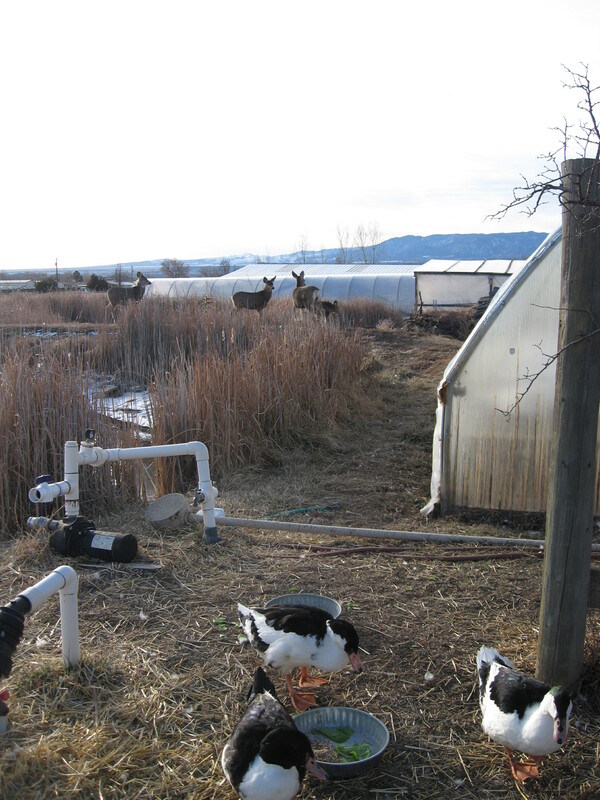 The deer have a lot of pasture grass they can forage on, so they don’t need to eat the ducks’ lettuce and grain. Last Monday we were supposed to get about 1/2″ of snow, but we ended up with around 4″ of very wet luscious snow. Great moisture for all the plants and critters and Shrek thought it was a great giant playground on our early evening walk that day. He really loves playing in the snow! Our greenhouse crew starts to work tomorrow, and Lizz and I have plenty of tasks we need help with. I’ll try to get some good pictures this week of the women who will be working with us this spring. We also have our annual Greenhouses inspection with the Colorado Dept of Agriculture. 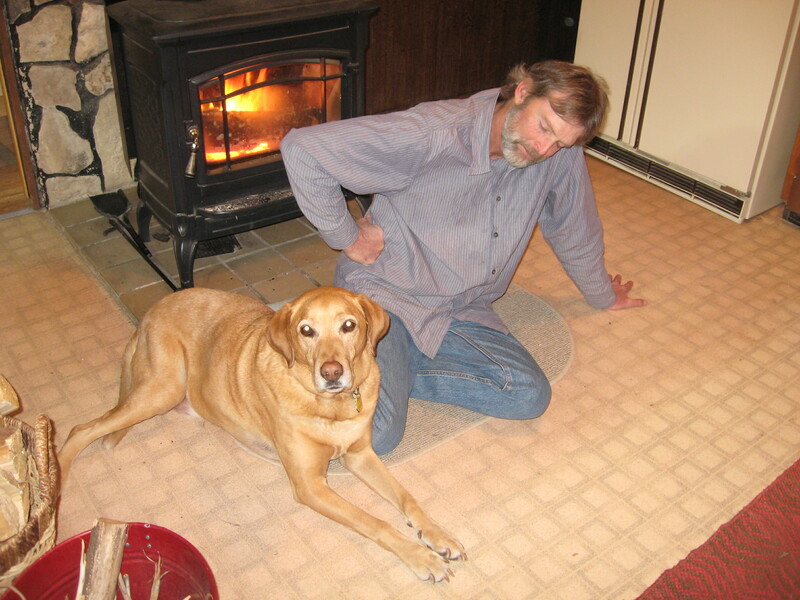 Two big shipments of supplies arriving, our tax appointment with the CPA and hopefully we can put a new skin on the Woodstove Greenhouse this week if we can find a day when there isn’t any wind. It’s going to be a full week I can tell already. Have a great week yourselves. January 22, 2019 Blooming Violets, Repairing Carts & Racks & More! 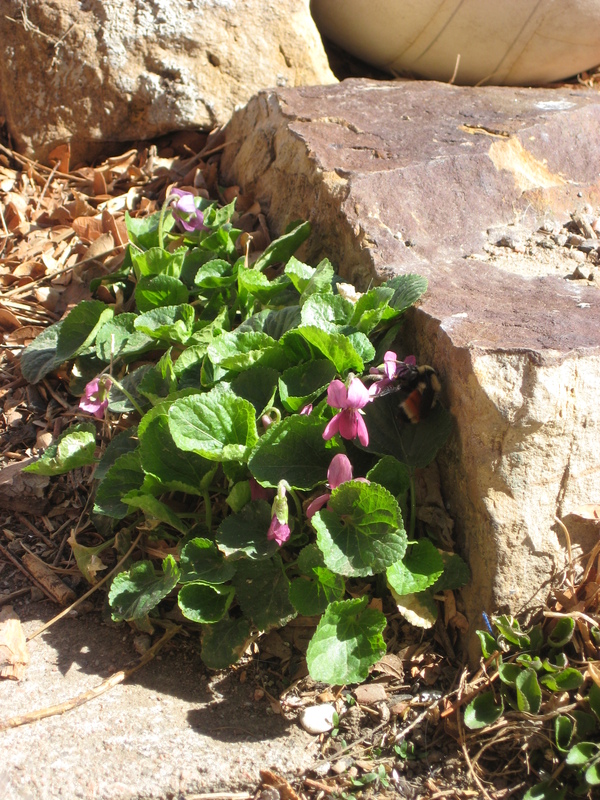 This past week, despite the fact that it is January and winter and even snowing at times, there are sweet violets blooming in my White Rabbit Garden behind our house. Perennial violets always amaze me because despite the weather and no matter what time of the year it is, it’s not unusual for me to find some violet flowers happening in the garden if I go out there and look around a bit. When I see them, they make me smile, because I know that before we know it there will be a lot of other things starting to bloom in the garden. So, chin up if you have the winter blues….spring will be here soon. And with that thought in mind, we are in full spring preparation mode around here. For the past week, Chris has been repairing and painting our plant racks and all the carts now have working wheels and no more rust! The carts especially take a beating around here, as we are always moving something, usually heavy, and there is nothing worse than to load up a cart completely full and then realize that a tire has blown out or that the wheel bearings stick and the darn thing won’t steer properly. That makes hard work even harder, so now we are happy that Chris has worked his magic on all the carts and now the racks, and they are in good working order…much easier to push or pull as needed. 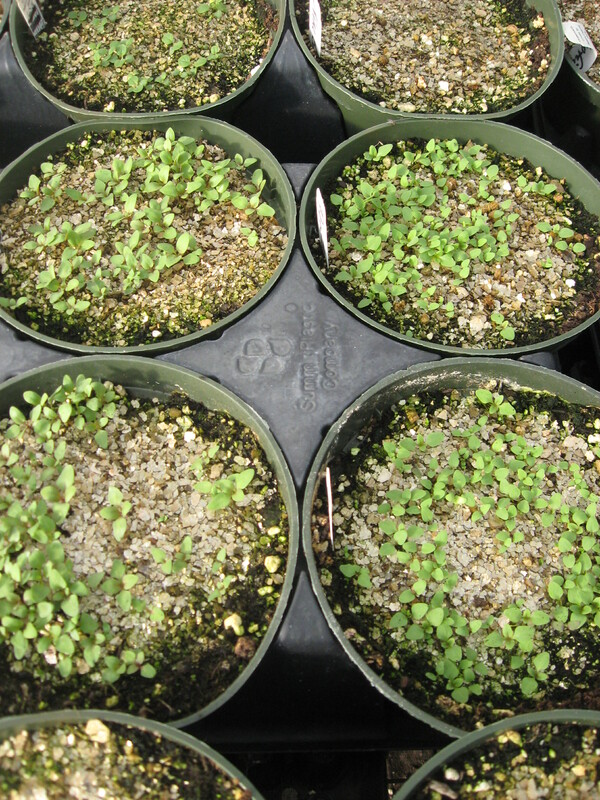 This week, Lizz has been working on cuttings and getting the hanging baskets ready to plant next week. She transplanted a boat-load of perennials and nearly filled an entire greenhouse with these newly transplanted baby plants. I spent the day planting the first crop of cool season vegetables. Beets, Swiss Chard and Kale, Broccoli and Cauliflower, Asian Greens and Spinach too. They may look like empty flats right now, but under the vermiculite are tiny seeds absorbing moisture tonight and even as soon as tomorrow they will start the process of sprouting into new tiny plants. It may not be spring outdoors yet, but it is really really looking like spring in the greenhouses now! 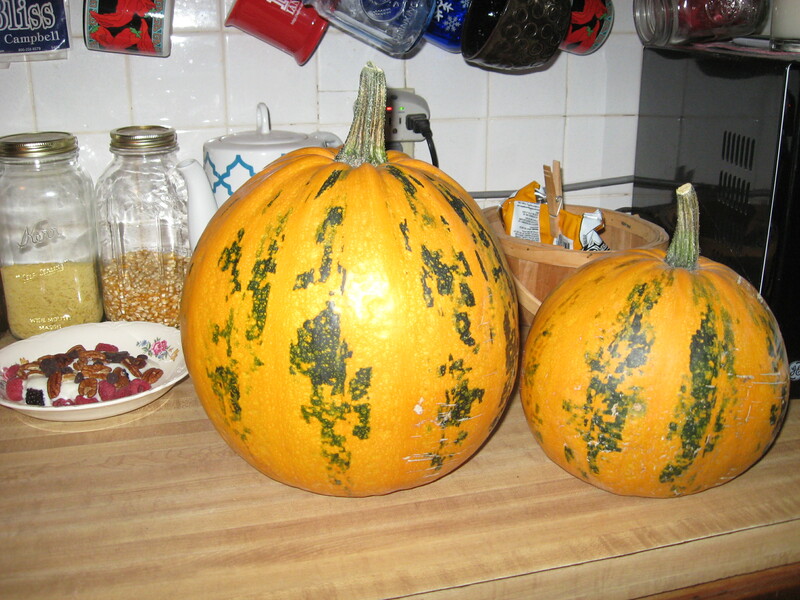 These are two Kakai Hulless Pumpkins that grew in my food garden last summer. They have been sitting on my kitchen counter for months now waiting for just the right time for me to cook them. That happened this past week too. Kakai pumpkins are beautiful with their orange and green markings and they always do well for me in my garden. They have bright orange flesh inside that cooks up firm and tasty and makes the best pumpkin pie or custard you have ever tasted. The seeds are hulless, hence the name, and they make a delicious snack if you roast them in a bit of butter in a 350 degree oven for about 20 minutes. Salt them with sea salt immediately when you take them out of the oven. Pumpkin seeds are really good for you, and are super good for men’s reproductive health, but more importantly than all that, is that they taste so yummy! If you are thinking about growing a different kind of pumpkin from the standard orange one (which of course we all love to grow), consider growing a Kakai Hulless Pumpkin this next year in your garden. I want to take a minute to talk about East Indian Lemon Grass. If you like to cook Asian food, then you will want to grow a pot of Lemon Grass to have on hand whenever you want to use it in a recipe. It is wonderful added to stir-fry dishes, included in soups, and it makes a very nice cup of lemony tea. You simply cut some of the grassy stalks and chop them up to add them to whatever you are cooking that you want to impart a luscious lemon flavor to. It is great added to grilled vegetables and chicken or fish. If your making a cup of tea, use 1-2 teaspoons of freshly chopped grassy tops per 1 cup of boiling hot water and let it steep for about 8-10 minutes. Then strain out the lemon grass herb and enjoy drinking your cup of tea. FYI: If you don’t want to have to strain your tea, use a mesh metal tea ball or bamboo tea strainer and simply lift the strainer out of your cup when your tea is steeped enough and your ready to drink it. 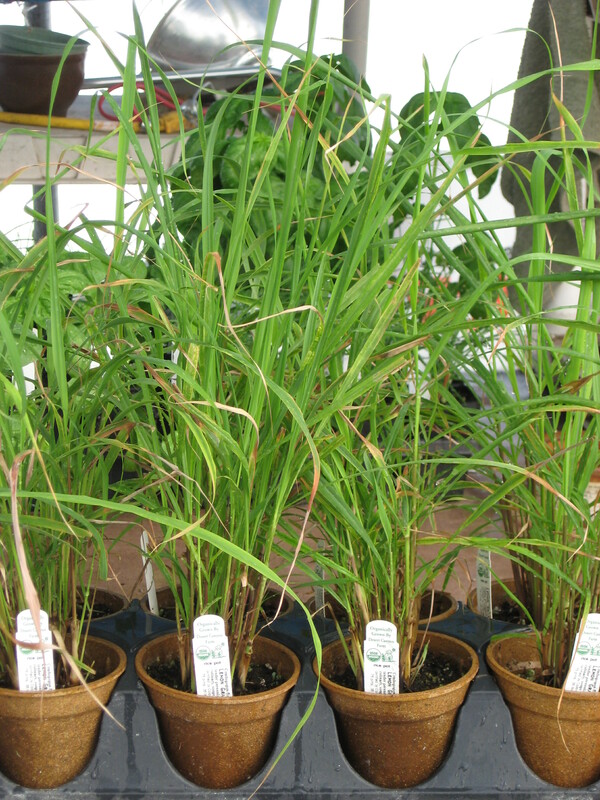 East Indian Lemon Grass is great grown indoors during the cold months of the year, as it is not a cold-hardy type of herb, and in the warm months of the year you can grow it in a container on your patio or even plant it right in the garden soil. Just remember if you plant it in the ground, you may want to pot it up again in early fall so that you can bring it back indoors to protect it from the severe cold temperatures of late fall and winter thru early spring when weather is unsettled. If you grow it in a pot, it will need to be fertilized every 3-6 weeks with an organic fertilizer (check with your local garden center to recommend a good brand to use). This will keep it thriving and happy. East Indian Lemon Grass is easy to grow and really delightful to have on hand for cooking. 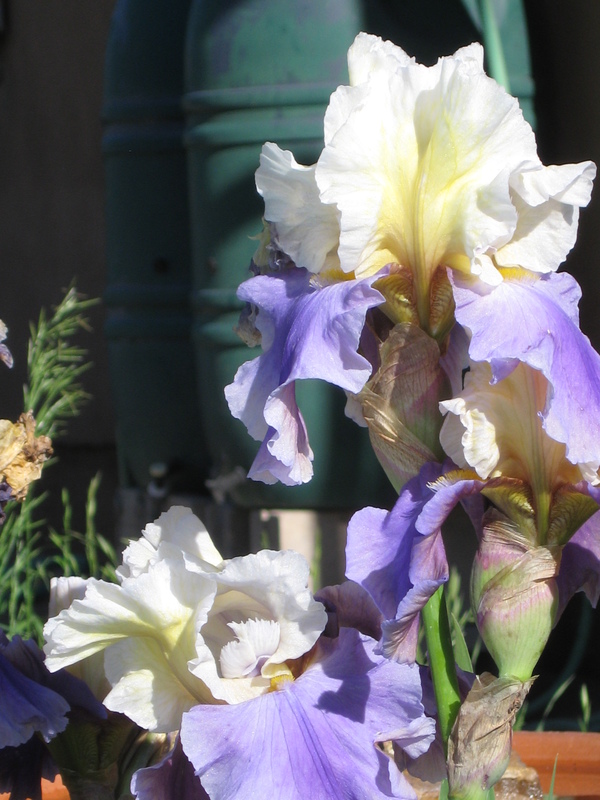 I’ll leave you with this picture of an iris that blooms in my garden every spring. I hope it makes you smile on this winter cold evening. January 13, 2019 Strawberries and Rosemarys, plus much more! This week is all about planting! Planting bare root strawberries, rosemary and other herb plugs, seeds and taking vegetative cuttings. Lizz and I have loads of work ahead of us this week. It’s going to require a lot of team work, laughter, chai tea for me and coffee for Lizz, and probably some serious amounts of chocolate!! 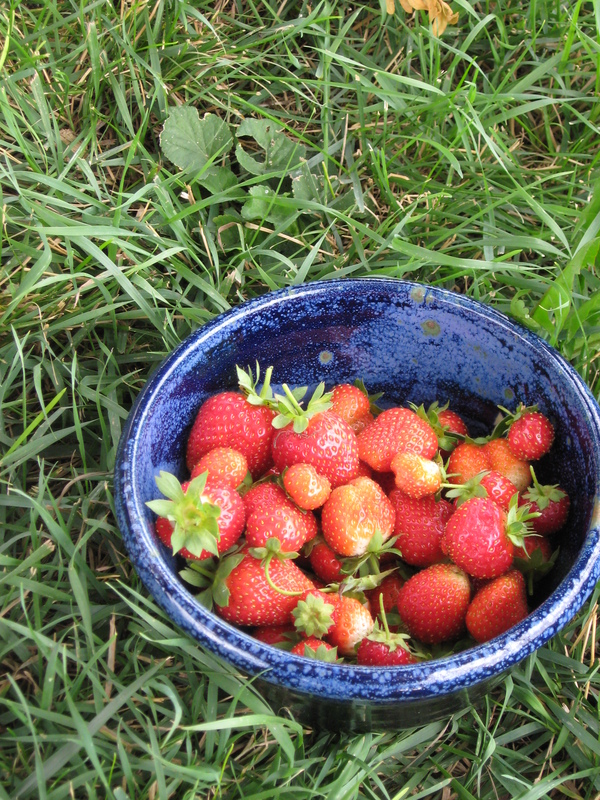 We do also grow alpine strawberries, which are the tiny flavor packed wild varieties that grow in our mountains and we will have a limited amount of Tarpan everbearing strawberries, which have bright pink flowers and produce good eating strawberries too. But those varieties that yield all their harvest within a couple of weeks once during the growing gardening season are just not for me. 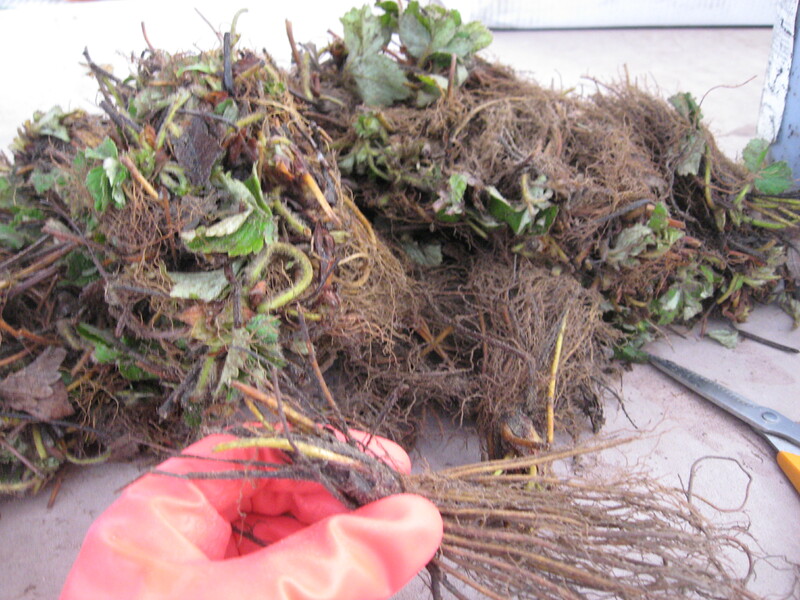 So, we plant the bareroot strawberry plants in January and put the newly planted giant six-packs of strawberries under frost blanket in an unheated greenhouse, where they will begin the process of rooting into the soil and leafing out. By mid-April, when we open our Farm Stand store during Open Farm Days here at Desert Canyon Farm, the strawberry plants will be ready to sell and may even be starting to flower and produce some fruit. Chris and I eat berries nearly every day of the year for breakfast and strawberries are a very big part of that breakfast food. 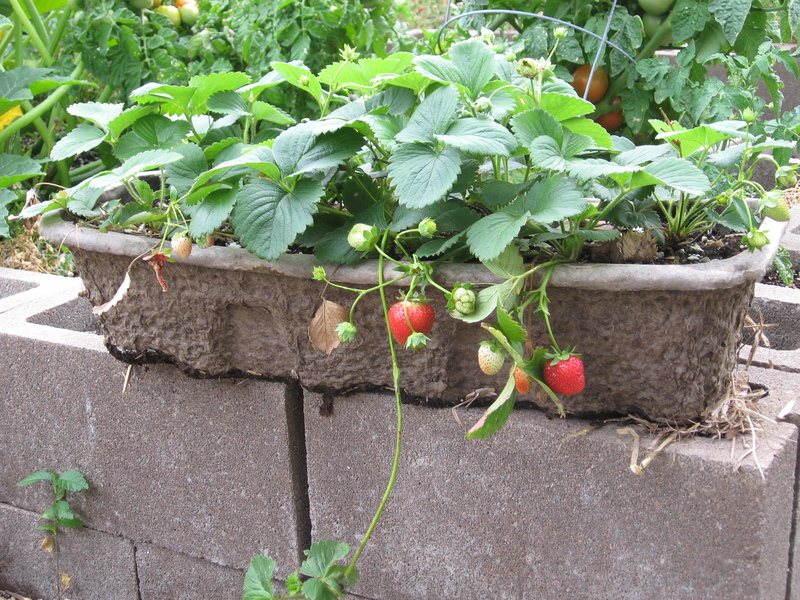 I even bring some of my strawberry plants indoors during the cold months of the year so that they will not go dormant for the winter and they will continue to produce tasty delicious strawberries we can eat for breakfast. Be expecting some great strawberry plants this spring for sale in our Farm Stand store. We should have a lot of them available. 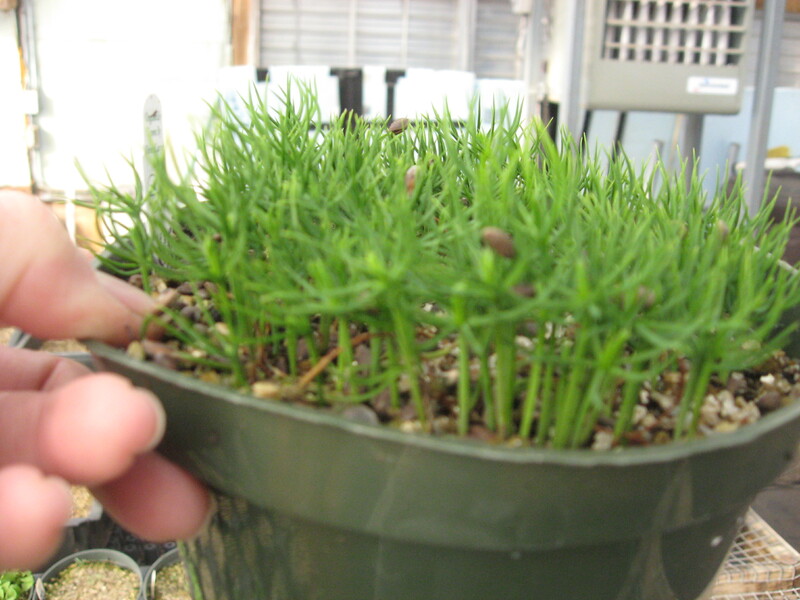 We also have loads of Rosemary and other herb plugs that are ready now to be transplanted into larger size pots. 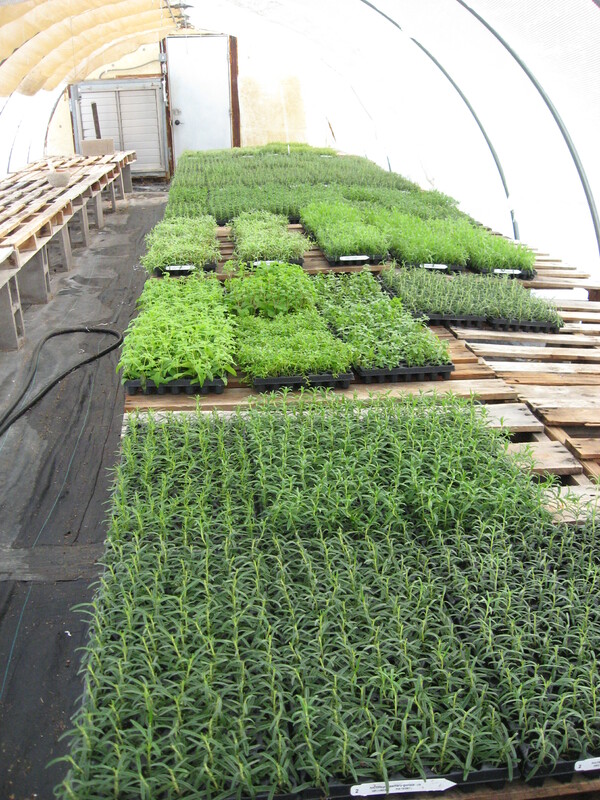 In addition to the Rosemary, there is Mexican Oregano, several varieties of hardy lavender, some lemon verbena, lots and lots of different thyme varieties and the same with different Penstemon varieties, plus baby birch trees, little mesquite trees, some carob plants and quite a few other plant varieties that are also ready to be transplanted. That’s going to keep us mighty busy. Finally, every week now between now and mid-May, we will have a list of seeds that need to be planted in order for them to be grown and ready to sell at various points on the calendar throughout the spring and early summer months. Last week, Lizz sowed the very first crop of peppers. And so it goes….spring has arrived in the greenhouses for sure. 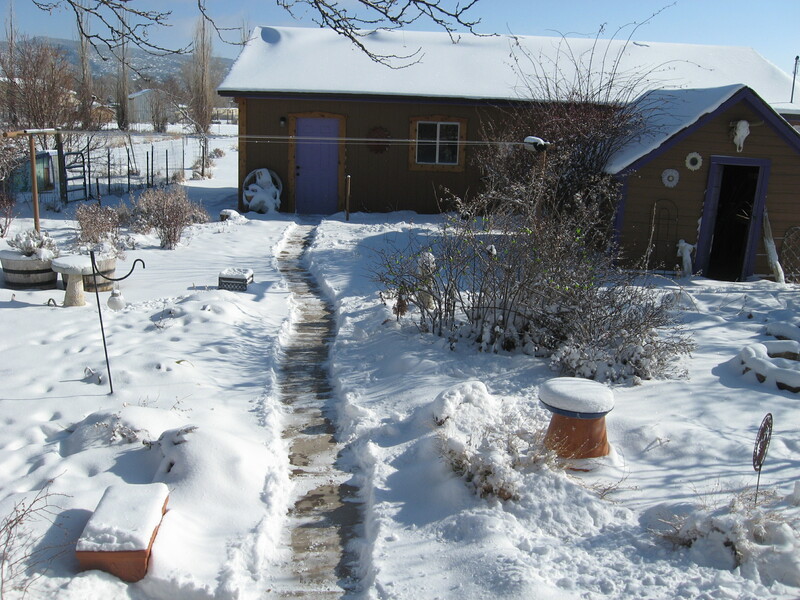 We’re busy and smiling as we prepare for the gardening and field seasons of the year, not just for us here at the farm, but for gardeners and growers all over Colorado and northern New Mexico that will be buying and growing our organic plants. Bring on the chai tea, coffee and chocolate…ready, set, go…it’s time to be busy! This past week we got some decent snow, not just a little dusting, but about 7″ or so. 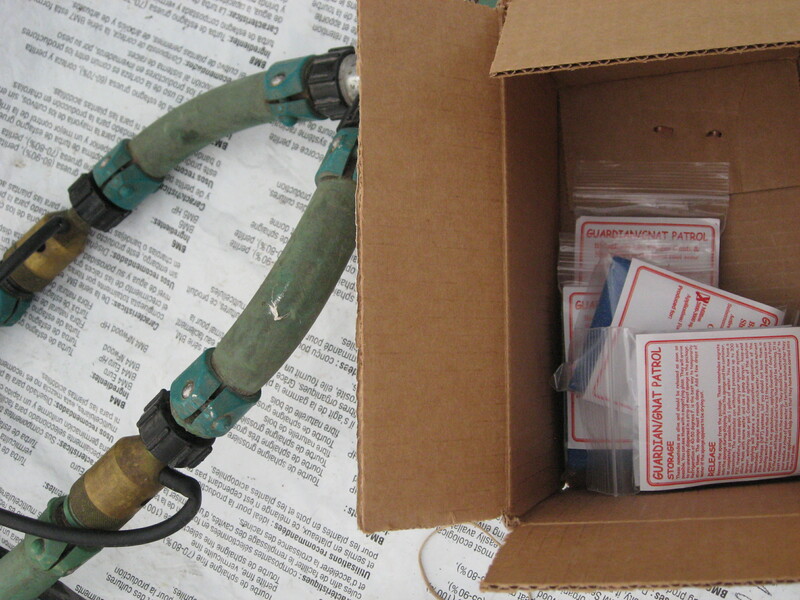 It amounted to 6/10″ moisture, which is enough to help. Everything has been getting so incredibly dry again, so we needed this shot of moisture and hoping more will come soon. For this week, at least, the weather looks warm and dry. That’s great for getting a lot of farm work done, so we’ll be extra busy taking advantage of the nice weather. A week ago we recovered the lizard greenhouse, which Lizz and I had cleaned the week before that. 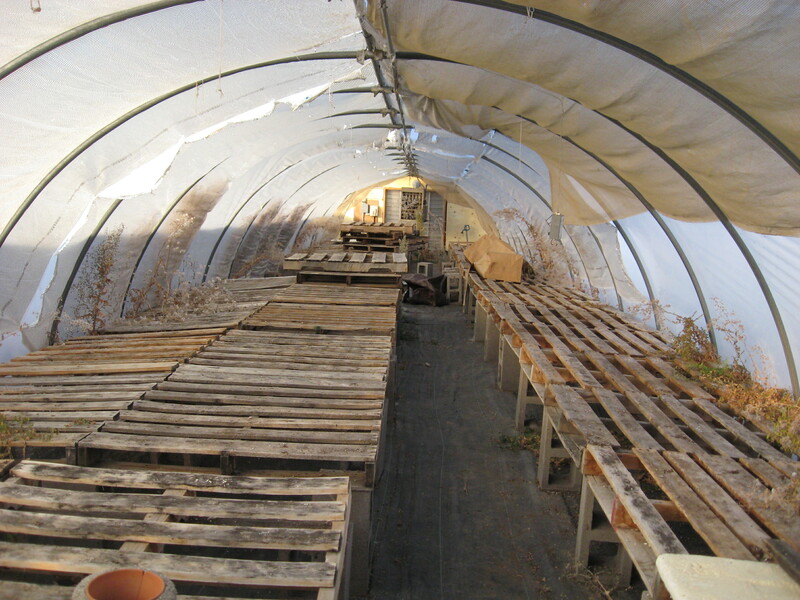 It’s now ready to start keeping plants warm and growing in preparation for the spring busy season. Tomorrow we will start filling it with plants, starting with thousands of baby rosemary plants. When I write a post at the end of this week, I’ll have a lot of greenhouse news to tell you about I’m sure. 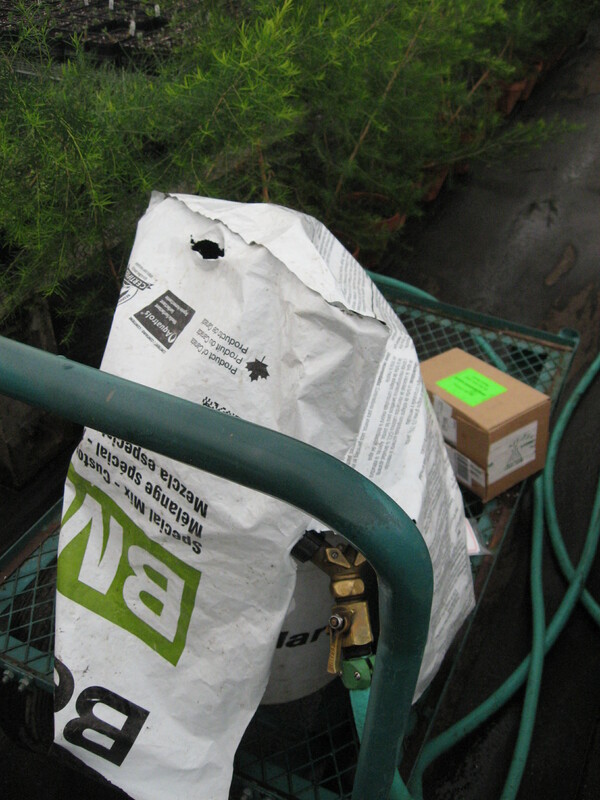 It’s also the time of year when we use a lot of beneficial nematodes to help prevent pest insects in the greenhouses. Beneficial nematodes feed on the larvae of pest insects like fungus gnats and shore flies, ant larvae, and other greenhouse pests. The nematodes have to be kept moist and in the dark or they will die straight away. They look like microscopic little worms if you put them under a microscope. They arrive in small packages as a dollop that contains a million of them on a small moist sponge. 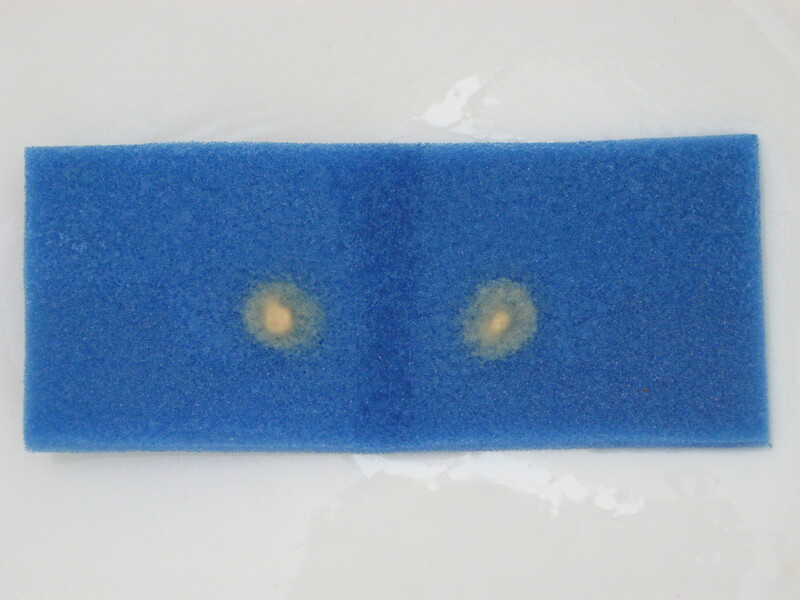 I put these into a bucket of water and gently squeeze the sponge to disperse the nematodes into the water. 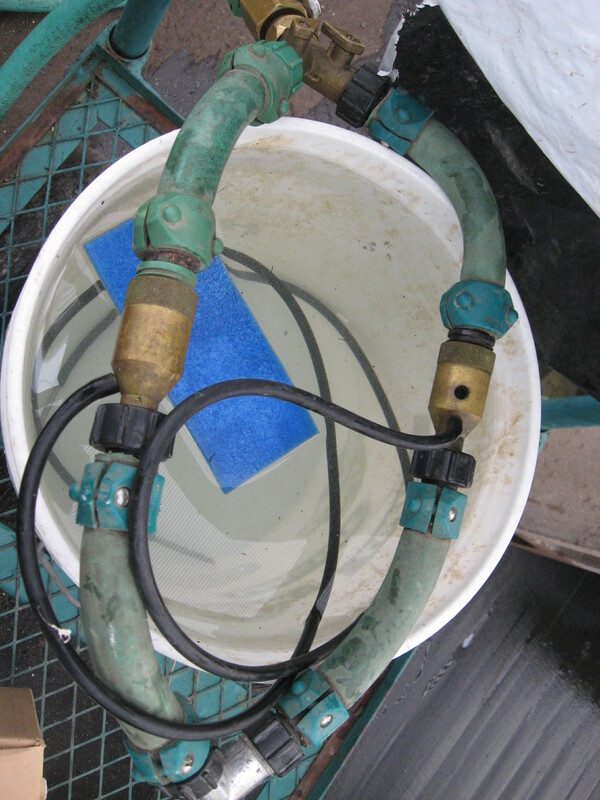 A syphojex hose attachment is used to apply the nematodes in their carrier of water to the plant’s soil as I water all the plants. The bucket of nematodes in the water is covered with a thick plastic cover that blocks out all the light from the bucket during the time I am watering the nematodes into the soil of the potted plants. The nematodes live in the moist soil of the potted plants and do their work of eating all pest larvae also living in that same soil. This approach works really well for us as part of our pest management protocol. 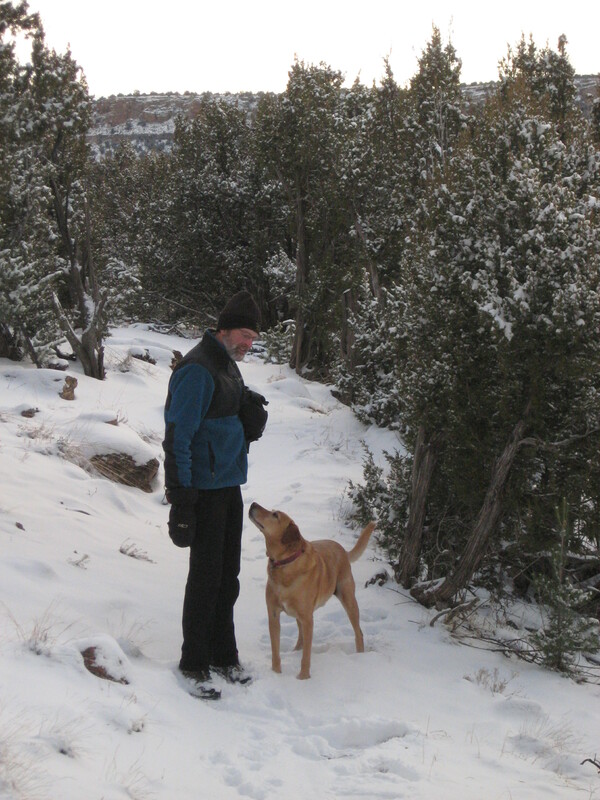 Meet Cleo, who is a hiking friend of Shrek’s, and belongs to our friends Marc and Joan. Today was supposed to be a work day for me, but the truth of the matter is, I just could not make my peace with working 7 days a week already even though I should be doing that by now. 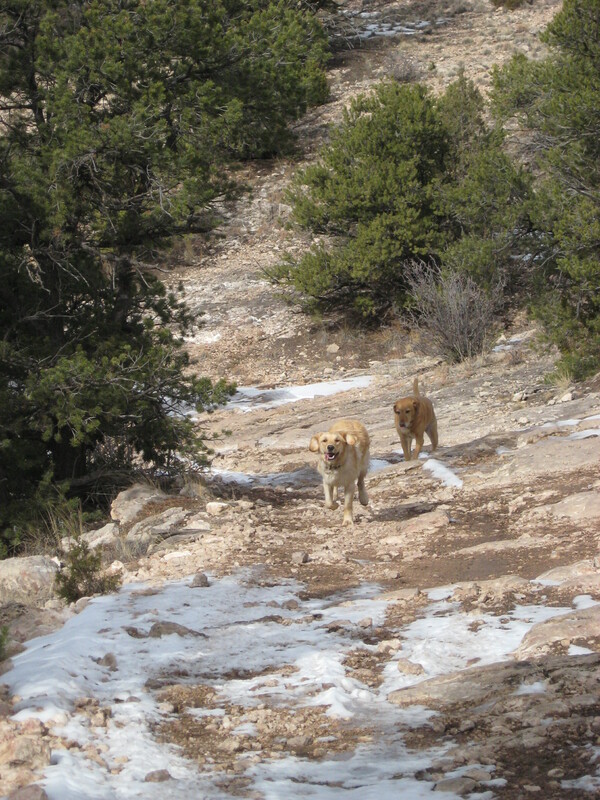 Today I played hooky from my work schedule and went for a hike with Chris, Marc, Cleo and Shrek instead. It was such a pleasant gorgeous weather day! I did my watering chores this morning in the greenhouses and then we left for our hike. I know I’ll pay the price tomorrow and this week, because I’ll have a lot of extra work that should have been done today to get done in the next few days, but hey….it was a really nice day to go for a hike and I’m glad I did that. Now it is time to build a fire for the evening and settle in to supper and closing out the rest of our day. December 27, 2018 Bonsall, Nebraska and the Start of a New Year! It’s been a little while since I wrote a post, but that is because the past two weeks have been filled to the brim with activity! On December 17th I went to California to work with Cornelia Funke (the wonderful and magical world-renowned children’s author) on several projects. 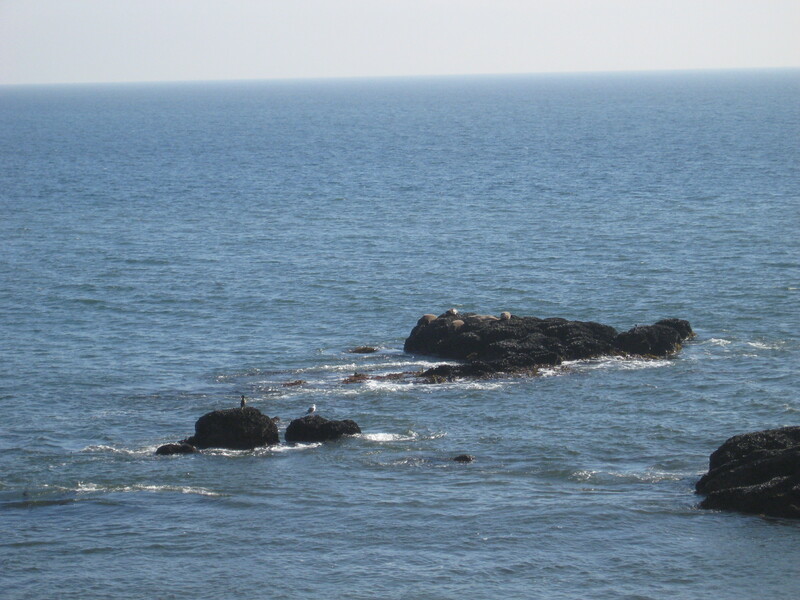 This also meant that after quite a few years, I got my “ocean fix” again as we stayed in a beach house during the evenings and went to her property (named Bonsall) during the days to work. Sadly, Cornelia’s property was caught in the middle of the Woollsey Wildfire several weeks back and much of her land was burned, hence the reason we stayed in the beach house rental, as her home at Bonsall wasn’t yet ready to be lived in after the wildfire damage. Thankfully, her amazing gardener, Alfonso and his crew of equally amazing men, were able to save her home, the barn and a few other structures, along with the ducks and donkeys, but there is so much work to do there to restore Bonsall to its past glory. It’s a work in progress, and indeed, so much progress is being made every single day. 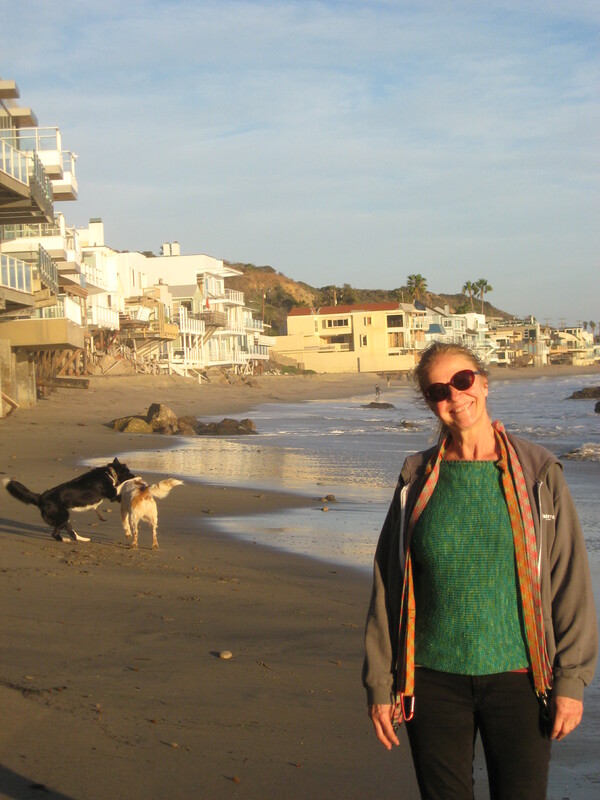 Meet Cornelia, and in the background is Tapper and Jake romping in the water as we walked the beach just before high tide and sunset each night. Bonsall has so many glorious parts to it. Of course there is the house and other buildings and the plantings around them, much of which was spared the wildfire’s worst damage. There is an entire grove of avocado trees loaded with fruit! 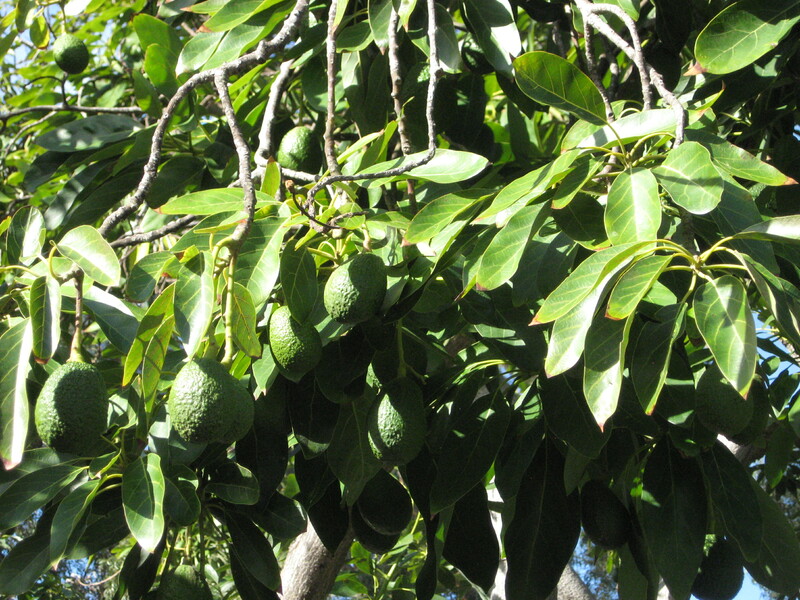 For us in Colorado and other places where this kind of fruit doesn’t grow, it’s hard to imagine having an endless supply of avocados to pick and eat every single day, but that is the case at Bonsall. 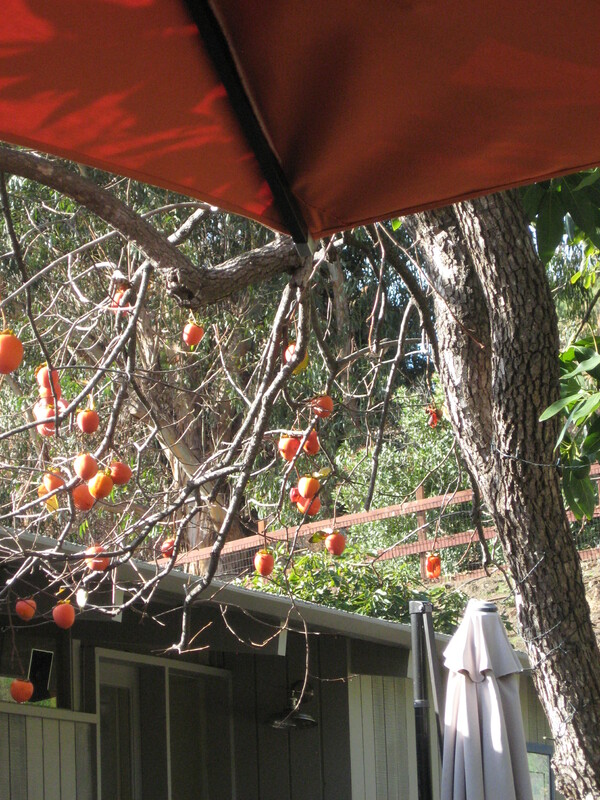 And persimmons too! But among all this abundance there are acres worth of trees and gardens that burned in the fire. The tree crews are working non-stop to remove the dead burnt trees. Other trees were burnt, but will come back with some time and tender loving care. There are gardens that we made plans for and she will start planting those as soon as the wildfire clean-up work is done. My tasks in being there is multi-purpose. I’m helping with the garden restoration work, along with the planting of some new special areas that will be very interactive with visitors to Bonsall. Cornelia and I are planning all sorts of things that will keep us busy together for some time and happily so. 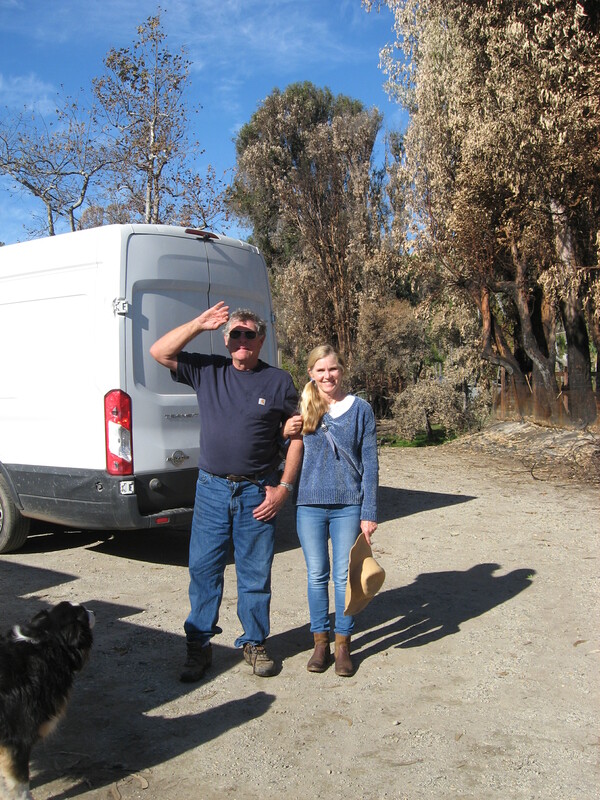 Now meet Larry and Laurel, who are organic farmers and next door neighbors to Cornelia and Bonsall. They were also badly damaged by the wildfire, but thankfully they were able to save their home, their farm structures and much of their crops and orchards. These folks are incredible!!! They have lemons, apples, all sorts of veggies and strawberries and so much more. In addition to selling produce directly from their farm, they also supply chefs at many of the area restaurants. 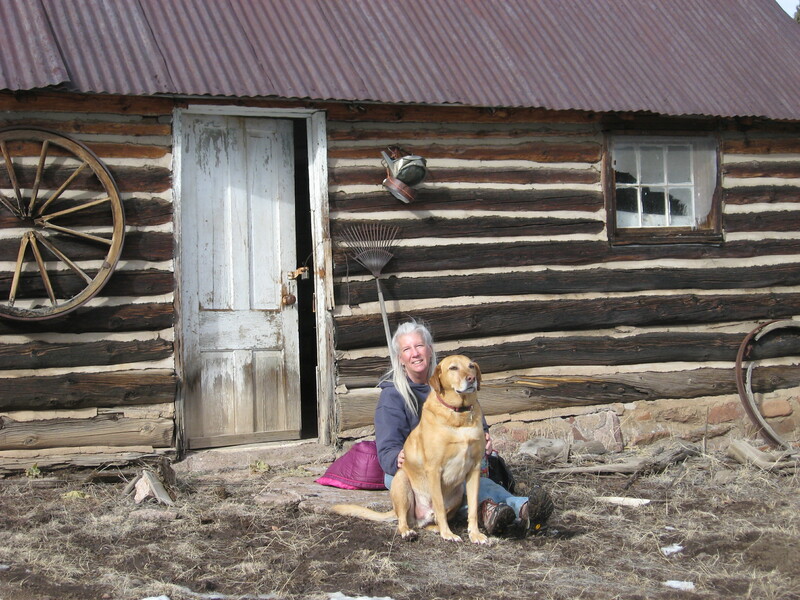 We spent a lot of time talking about “farm life” and earning a right livelihood as organic farmers. Cornelia and Angie (her right hand assistant) have big plans to bring children into the work at Bonsall and my help with the plants will be part of that work. I think these two women have endless amounts of energy and it truly is inspiring! So, it was an amazing work trip, that also gained me some wonderful friendships, and I’m looking forward to the ongoing projects we will be working on going forward. 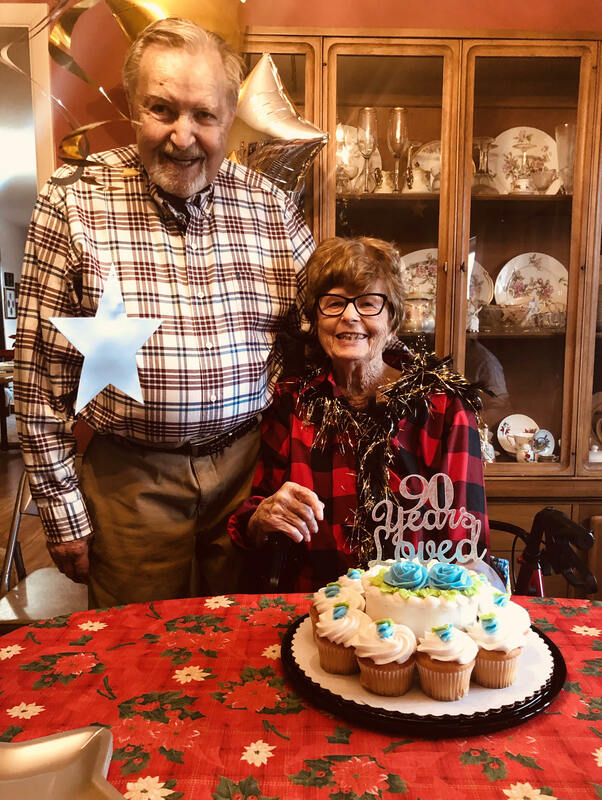 I was only back a couple of days from California and we left to visit our family in Nebraska for the Christmas holiday and to celebrate Mom’s 90th Birthday! She really is totally “90 Years Loved” by all of us and it was fantastic to see all of the family there and have time to visit. Sadly, our trip was cut a little bit short, as a winter storm came in and Chris and I scrambled to drive ahead of it back home to Colorado. The roads between Colorado and Nebraska are NOT where you want to be in the middle of a bad weather event, so thankfully, we got home before the worse of the weather hit, but it followed us all the way in Nebraska with freezing rain and snow. 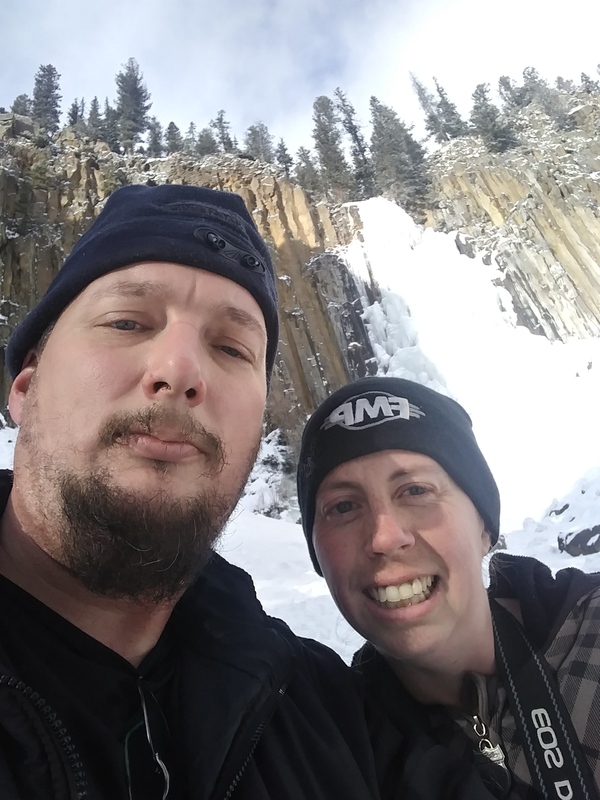 M’lissa and Luke were able to get out and enjoy some of the snowy Christmas weather in Montana on Christmas day. They were checking out some ice climbing waterfalls that were so beautiful. We were happy to get some pictures so that we could see the countryside too in their new Montana home. Today, begins my return to major farm work as we prepare for the spring busy season. There is so much now to do every day. It always seems odd to others that for us spring in the greenhouses begins the last week of December, even though outdoors and the to the rest of the world it is only just the early days of winter. So, have a wonderful end to this year 2018. In a few short days the new year will arrive and so will the new adventures that come with it. Here is to a year of wonderful and good adventures in all things for all of us and for this Mother Earth we live on. A year of laughter and joy, good health, lots of smiles, and everything else that makes our lives happy and filled with gratitude. Do you have daily habits that you stick to and have kept for years and years? Breakfast is like that for Chris and I. 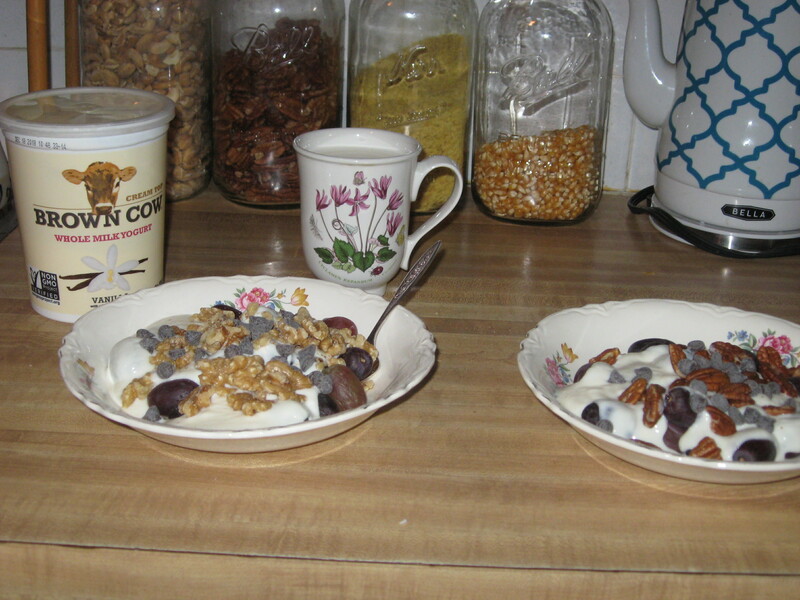 For more than 23 years we’ve eaten the same kind of breakfast nearly every day…fresh fruit (usually berries), Brown Cow vanilla cream-top yogurt, nuts (pecans for Chris and walnuts for me), with chocolate chips sprinkled on top to make it gourmet! I love this breakfast and it is just what my body needs to start a busy day of farm work or whatever I’m doing on any given day. 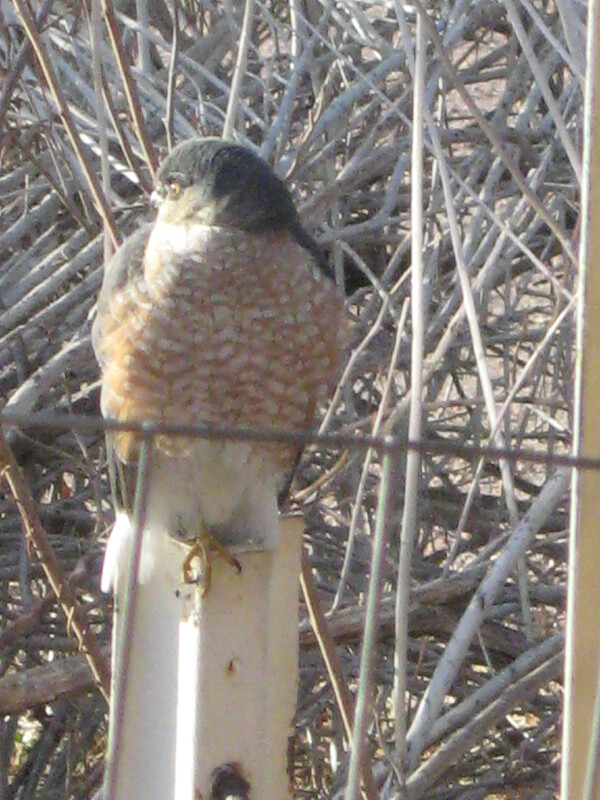 And this week while I was eating breakfast, Chris motioned for me to look out the window and there was this hawk sitting in the middle of the south bird garden hunting its breakfast meal (probably a ring-neck dove is the usual choice). 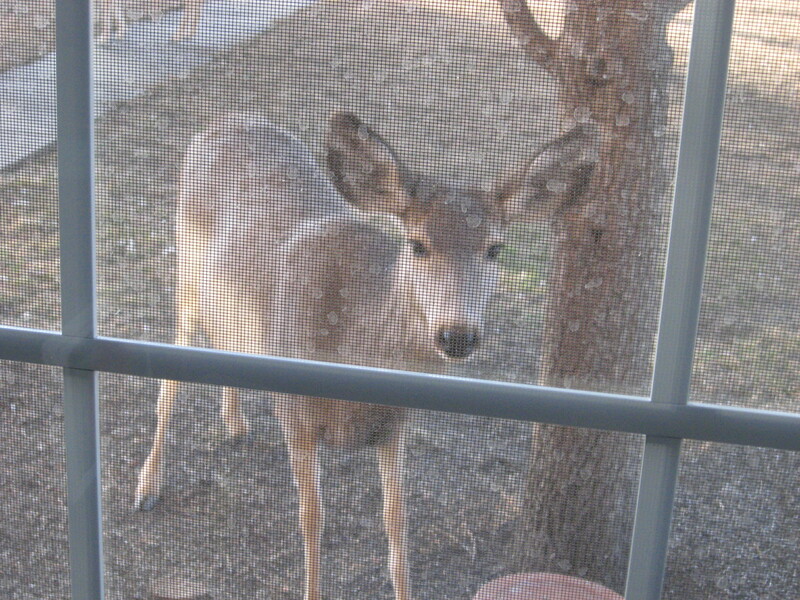 It’s amazing how wild critters hunt what they need to nourish themselves, but they usually don’t hunt for sport. Usually, they hunt only what is needed. We humans could learn from that I think. 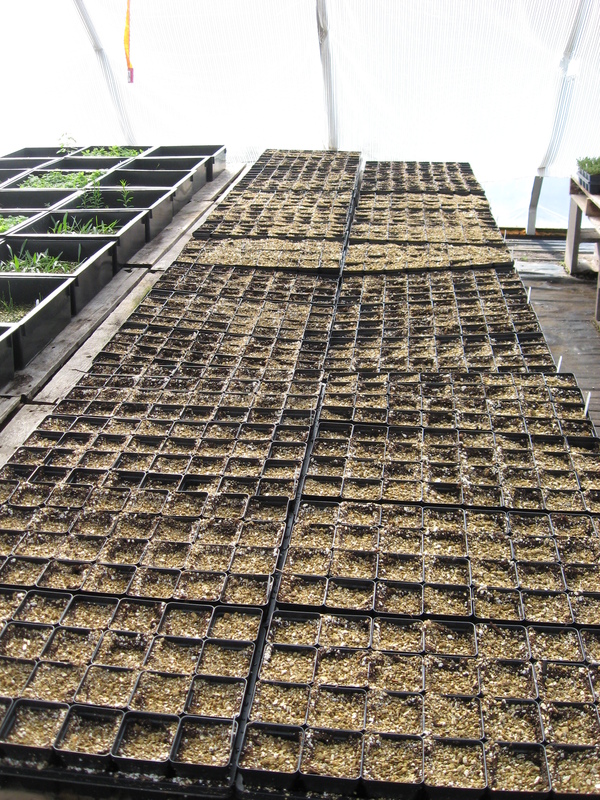 As for greenhouse work, we are up to our eyeballs in seedlings waiting to be transplanted into plugs or larger pots. All kinds from native penstemons to spilanthes and aloes, and loads of other plant varieties. Even these baby Bristle Cone Pines! Aren’t they sweet little trees!! 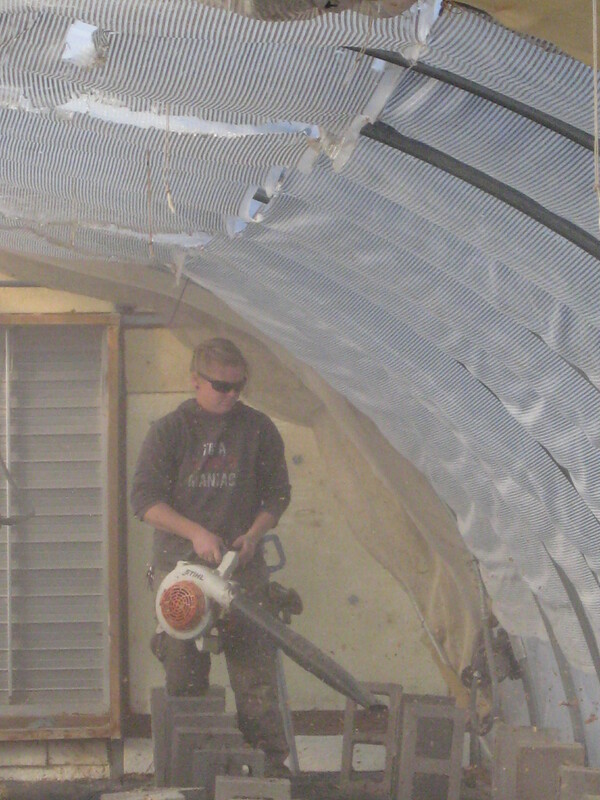 We are still working nearly every day on big projects of greenhouse and farm maintenance/housekeeping tasks. Last week, Lizz and I cleaned the Lizard Greenhouse in preparation of putting plants in this house the week of December 31st. It was a terrible mess, as it has been empty of plants since last end of May. The weeds had grown in, shade cloth had fallen down, pallet benches needed repaired and so on. There was a lot of dust involved. But now it is all perfectly clean and tidy and ready for plants! Yahoo!! These willows grow along the edge of our goldfish pond (which doesn’t have a single goldfish in it, just blue gills) and the willows provide a lot of great wildlife habitat for red-wing blackbirds, red slider ear turtles, fish, raccoons, foxes, and others. Even the three domestic duck ladies, Hannah, Gretel and Rosie, like to hang out in the willows and this little pond when it is hot outside. Chris will be cutting down the willow branches to just above the ground this next week. 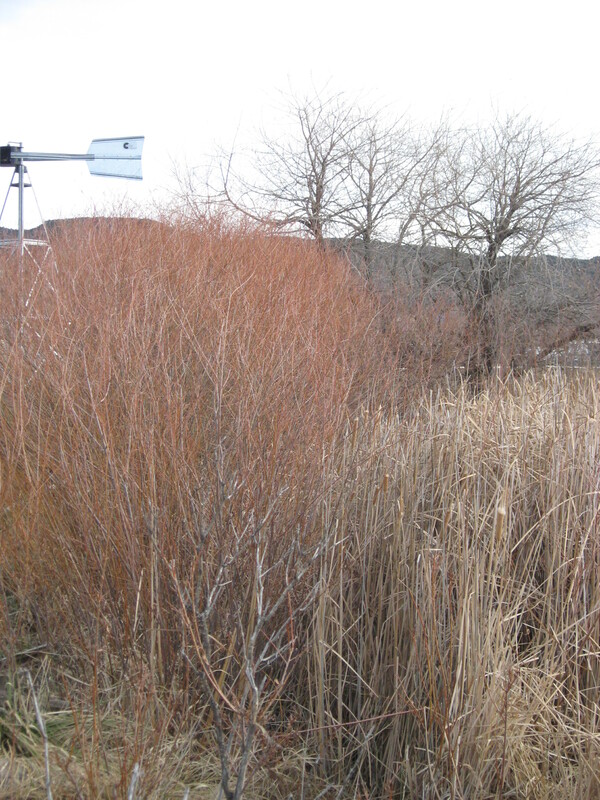 That is called “coppicing” and it doesn’t hurt the willows at all, in fact, it keeps this stand of willows happy and healthy. The cut branches will not be wasted either, because we’ll trim off the small side branches and make willow stakes from the long branches, much like bamboo stakes you buy in the garden center. We’ll use these stakes for tomato plants, vining plants like hops, morning glories and passionflower fruit vines. It’s a win win for all of us, including the willows and the wildlife, because by middle of spring they will be growing back very nicely just in time for red-wing black bird nesting season. All for now. See you next week.